^ 1.0 1.1 1.2 1.3 1.4 1.5 van Leeuwen, F. Validation of the new Hipparcos reduction. Astronomy and Astrophysics. November 2007, 474 (2): 653–664. Bibcode:2007A&A...474..653V. arXiv:0708.1752. doi:10.1051/0004-6361:20078357. ^ 3.0 3.1 Samus, N. N.; Durlevich, O. V.; 等. VizieR Online Data Catalog: General Catalogue of Variable Stars (Samus+ 2007-2013). VizieR On-line Data Catalog: B/gcvs. Originally published in: 2009yCat....102025S. 2009, 1. Bibcode:2009yCat....102025S. ^ Lamers, H. J. G. L. M.; Harzevoort, J. M. A. G.; Schrijver, H.; Hoogerwerf, R.; Kudritzki, R. P. The effect of rotation on the absolute visual magnitudes of OB stars measured with Hipparcos. Astronomy and Astrophysics. 1997, 325: L25. Bibcode:1997A&A...325L..25L. ^ 7.0 7.1 Tetzlaff, N.; Neuhäuser, R.; Hohle, M. M. A catalogue of young runaway Hipparcos stars within 3 kpc from the Sun. Monthly Notices of the Royal Astronomical Society. 2011, 410: 190. Bibcode:2011MNRAS.410..190T. arXiv:1007.4883. doi:10.1111/j.1365-2966.2010.17434.x. ^ 8.0 8.1 8.2 Challouf, M.; Nardetto, N.; Mourard, D.; Graczyk, D.; Aroui, H.; Chesneau, O.; Delaa, O.; Pietrzyński, G.; Gieren, W.; Ligi, R.; Meilland, A.; Perraut, K.; Tallon-Bosc, I.; McAlister, H.; Ten Brummelaar, T.; Sturmann, J.; Sturmann, L.; Turner, N.; Farrington, C.; Vargas, N.; Scott, N. Improving the surface brightness-color relation for early-type stars using optical interferometry⋆. Astronomy & Astrophysics. 2014, 570: A104. Bibcode:2014A&A...570A.104C. arXiv:1409.1351. doi:10.1051/0004-6361/201423772. ^ 10.0 10.1 10.2 Allen, Richard H. Star Names: Their Lore and Meaning reprint. New York, NY: Dover Publications（英语：Dover Publications） Inc. 1963: 237. ISBN 0-486-21079-0. ^ 16.0 16.1 Nieva, Maria-Fernanda; Przybilla, Norbert. Present-day cosmic abundances. A comprehensive study of nearby early B-type stars and implications for stellar and Galactic evolution and interstellar dust models. Astronomy & Astrophysics. 2012, 539A: 143–63. Bibcode:2012A&A...539A.143N. arXiv:1203.5787. doi:10.1051/0004-6361/201118158. ^ Johnson, H. L. Photometric Systems. Basic Astronomical Data: Stars and stellar systems. 1963: 204. Bibcode:1963bad..book..204J. ^ Walborn, Nolan R. Some Spectroscopic Characteristics of the OB Stars: An Investigation of the Space Distribution of Certain OB Stars and the Reference Frame of the Classification. Astrophysical Journal Supplement. 1971, 23: 257. Bibcode:1971ApJS...23..257W. doi:10.1086/190239. ^ Schröder, S. E.; Kaper, L.; Lamers, H. J. G. L. M.; Brown, A. G. A. On the Hipparcos parallaxes of O stars. Astronomy and Astrophysics. 2004, 428: 149. Bibcode:2004A&A...428..149S. arXiv:astro-ph/0408370. doi:10.1051/0004-6361:20047185. ^ Levenhagen, R. S.; Leister, N. V. Spectroscopic analysis of southern B and Be stars. Monthly Notices of the Royal Astronomical Society. 2006, 371: 252. Bibcode:2006MNRAS.371..252L. arXiv:astro-ph/0606149. doi:10.1111/j.1365-2966.2006.10655.x. ^ （中文） 中國星座神話, written by 陳久金. Published by 台灣書房出版有限公司, 2005, ISBN 978-986-7332-25-7. ^ Kunitzsch, Paul. 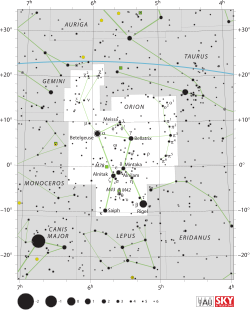 The Star Catalogue Commonly Appended to the Alfonsine Tables. Journal for the History of Astronomy. 1986, 17 (49): 89–98 [2018-10-01]. Bibcode:1986JHA....17...89K. doi:10.1177/002182868601700202. （原始内容存档于2017-03-31）. ^ IAU Working Group on Star Names (WGSN). [2016-05-22]. （原始内容存档于2016-06-10）. ^ Bulletin of the IAU Working Group on Star Names, No. 1 (PDF). [2016-07-28]. （原始内容存档 (PDF)于2016-09-16）. ^ IAU Catalog of Star Names. [2016-07-28]. （原始内容存档于2016-10-04）. ^ Dorn, Bernhard. Description of the Celestial Globe belonging to Major-General Sir John Malcolm, G.C.B., K.L.S., &c. &c., deposited in the Museum of the Royal Asiatic Society of Great Britain and Ireland. Transactions of the Royal Asiatic Society of Great Britain and Ireland. July 1830, 2 (2): 371–392. doi:10.1017/S0950473700000513. ^ Knobel, E. B. Al Achsasi Al Mouakket, on a catalogue of stars in the Calendarium of Mohammad Al Achsasi Al Mouakket. Monthly Notices of the Royal Astronomical Society. June 1895, 55 (8): 429. Bibcode:1895MNRAS..55..429K. doi:10.1093/mnras/55.8.429. ^ Harney, Bill Yidumduma; Cairns, Hugh C. Dark Sparklers Revised. Merimbula, New South Wales: Hugh C. Cairns. 2004: 139–40 . ISBN 0-9750908-0-1. ^ MacDonald, John. The Arctic sky: Inuit astronomy, star lore, and legend. Toronto, Ontario/Iqaluit, NWT: Royal Ontario Museum/Nunavut Research Institute. 1998: 52–54, 119. ISBN 9780888544278.